Adam Jacot de Boinod is a British author, most famous for his works about unusual words. He has written three books, the first two (The Meaning of Tingo and Toujours Tingo) looking at words that have no equivalent in the English language and his latest book (The Wonder of Whiffling) looking at unusual words in English. 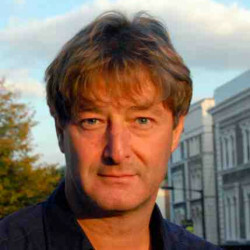 He worked on the first series of the television panel game QI. He then began to investigate languages, examining 280 dictionaries and 140 websites. This led to the creation of his first book in 2005, The Meaning of Tingo, a book featuring words which have no equivalent in the English language, “tingo” being a word from the Pascuense language of Easter island meaning, "to borrow things from a friend's house, one by one, until there's nothing left". He then wrote up a follow-up book entitled Toujours Tingo in 2007. In 2009, de Boinod wrote The Wonder of Whiffling, a book about unusual words in English. He is now a freelance journalist writing about language, cultural comparisons and travel. The Guardian, Penguin Books, The Independent, The Travel Magazine, Linkedin, The Telegraph, USA Today.